If you are planning to buy a Matterport Camera, you can save $900 through 30 November 2016. That's up from $600 that was offered for the last few months. 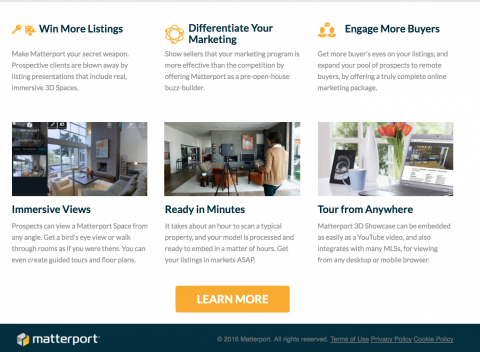 [Reminder: getting started with Matterport is about a $10,000 investment in Camera, Camera Gear and accessories]. I noticed this Matterport Google AdWord today (Sunday, 6 November 2016). 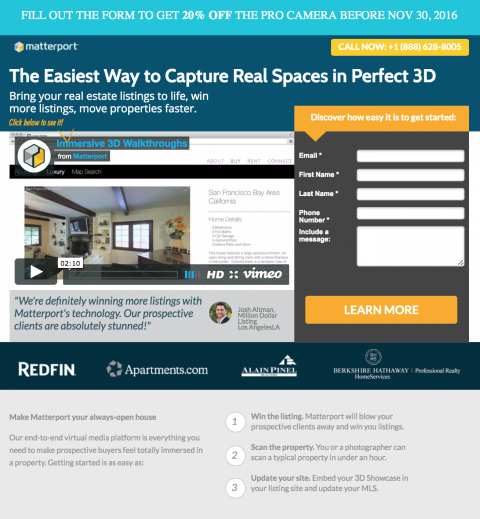 Anyone creating Matterport Spaces in Minutes? Yes, if it's less than 5 scans! Really, NO. My typical property yesterday took about 2400 minutes to scan. But not the rest of the world. Had I have done a fact check, we would see they're a little bigger than that. I finish most spaces under 2500 Sqft in about 10-15 minutes and I am also only charging .00007 cents per square foot, isn't that what everyone else is doing!!!!!!!!!!!!!! @ron0987 um, yeah, that was last year's rate. We do it for .000065 now, and we throw in a free unicorn on the 3rd scan. If we don't finish in less than 5 min, the scan is free!!! After upgrading to iPad Pro I feel like the time per scan has decreased a little bit. We also feel that the alignment issue is more forgiving (creating some funky alignment at doors and stairs). The time per scan is about 40 - 50 seconds per scan including moving the camera. We also, are avoiding camera reflection on mirrors in about 95% of our scans by lowering the camera in bathrooms specially or hiding behind features, plants or stack of towels. Since we provide still photos taken from the tour we scan each room from the 4 corners at a minimum, we scan all around dining tables and breakfast nooks and we are 100% "no black areas" in the iPad map. We also mark features during scans and move camera during transferring and alignment. We finished an 80% staged house of 3,300 sf, with 130 scans. So, it was slightly over 1.5 hours. The In-Out of the house was closer to two hours. Including turning on and off all lights, reporting of lights that do not turn on, closing or opening blinds and other administrative issues that we usually coordinate with the Realtors. 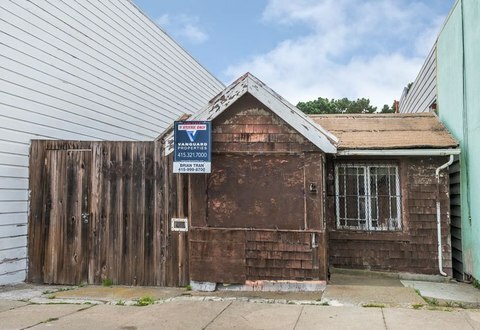 We are between 8 and 12 cents per sf but we include a generic single prop website (generic), still photos (no photoshop) and on their first order we throw in a floor plan drawing which they will pay after the second scan. If you bought your Matterport Camera in the last 30 days, you may (still) be able to save up to $900 by emailing Matterport Support to either honor the discount or arrange to return your Camera. A number of Members have shared with me that they were successful in doing this. In most cases, they asked their Matterport sales rep (whom referred them to Matterport Support). (a) Return Policy for Cameras Without Faults. One time only, You may, at Your expense, return an undamaged Camera to Matterport in the original packaging with the original receipt within 30 days of the date of the original shipment of the Camera to You. If the Camera and original packaging are returned within this timeframe and confirmed by Matterport not to be damaged, Matterport will provide a full refund based upon the original payment method. You cannot return unwanted items after 30 days. The foregoing return right applies only to the first Camera returned by You. In the event You have previously returned a Camera and received a refund from Matterport, subject to those rights set out below regarding Cameras with faults, You will have no subsequent right to return any other Camera without the prior written consent of Matterport, which consent Matterport may grant or withhold in its sole discretion.